Micro/sys Vision Development Kit Based on Micro/sys' ARM single board computers (SBCs), Vision Development Kits are ideal for system developers who need an SBC camera solution with fully integrated hardware and software. Micro/sys' Vision Development Kits brings together the user's camera of choice with a fully functional vision target system that runs right out of the box. 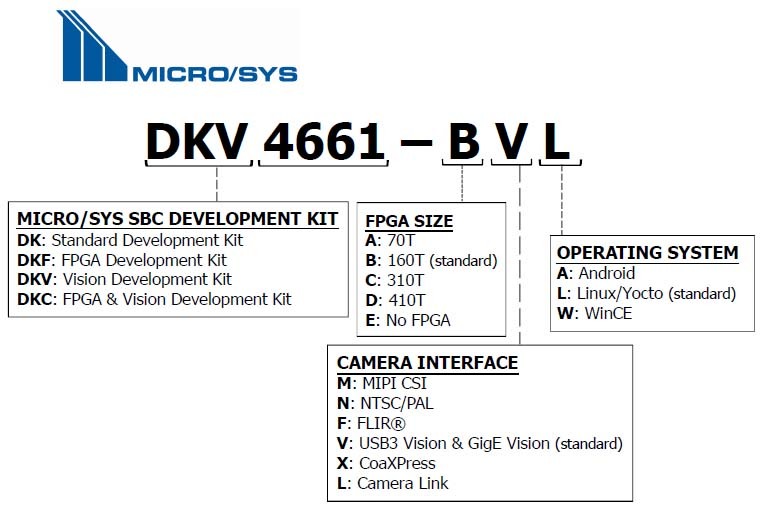 Today's embedded system designer has many camera sensor interface options to choose from when implementing an embedded vision system. Typically, camera intefaces are supported and maintained by standards organizations and the protocols are distingished by their operational advantages. Accordingly, each interface must be carefully evaluated for suitability with the overall embedded system requirements and constraints. 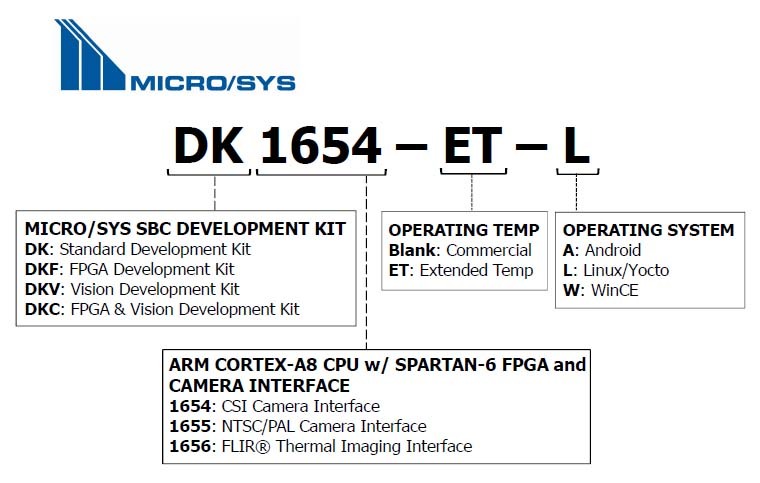 The chart below compares today's more popular camera interfaces and provides a framework for some of the key factors to consider when selecting a camera for your embedded application. 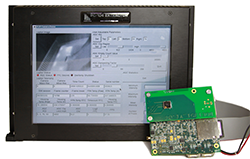 Camera Link® is implemented on Micro/sys single board computers by installing FPGA IP cores. A Camera Link camera connects to the SBC via a COTS interface board attached to the SBC. The onboard FPGA handles all of the vision processing tasks and can deliver the images for display or storage. PC/104 3.5" x 3.5" EPIC 4.5" x 6"
Camera Link is a real-time machine vision protocol developed to provide users maximum flexiblity and control over the camera sensor for high bandwidth (maximum 850 MB/s) parallel communication. There are three performance level configurations ranging from 2.04 Gbps of data throughput (Base) to 4.08 Gbps (Medium) and 5.44 Gbps (Full), both of which require an additional Camera Link cable. User configurable options via GenICam range from low resolution and low frame rate to extremely high resolution and/or high frame rate. Pixel depths and formats (luminance, color, temperature etc. ), and encodin (Bayer) can vary with the type of camera. Most Camera Link implementations are augmented with FPGA resources that implement filters, comparisons, frame stamping, and statistical analysis of a captured image or video data. The standard is maintained and administered by the Automated Imaging Association, or AIA, and a wide range of camera manufacturers provide compliant cameras. CoaXPress is implemented on Micro/sys single board computers through the FPGA's FMC interface and with IP cores installed in the FPGA. Handling all of the "frame grabber" activies, the FPGA has the capacity for multiple CoaXPress cores and other vision processing, while the onboard Quad Core Cortex-A9 handles PC-type interfaces and functions under a Linux operating system. 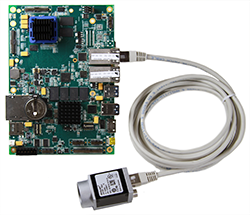 The CoaXPress camera connects securely to the SBC via an interface board which can power the camera up to 13W. Stand alone FPGA implementations are also available. CoaXPress is a high-resolution point-to-point protocol capable of high speed serial transmission of images for applications needing real-time video image acquisition. The CoaXPress standard defines six different speeds of video transport downlinks from camera to computer that range from 1.25 Gbps on long distance cables to 6.25 Gbps on shorter cables. Cameras communicate to the host computer through a standard 75ohm coaxial cable. Camera control and triggering parameters are established through a 20 Mbps uplink channel from computer to camera. The CoaXPress standard defines the transfer of video data, control data, triggers, and general purpose I/O over a single link. Power for the camera is defined on the cable and cable lengths of greater than 200 meters are supported. The standard is maintained and administered by the Japan Industrial Imaging Association, or JIIA. 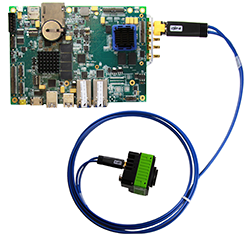 GigE Vision® is standard on select Micro/sys single board computers via the onboard gigabit Ethernet port hosted by the ARM Cortex-A9. The Linux BSP integrates OpenCV and GStreamer for easy user access so application programs can be written quickly. Other options include moving the camera/sensor data to memory and directing it to the FPGA for typical vision processing or displayed via HDMI. The onboard FPGA handles any vision processing tasks normally performed by a frame grabber which off-loads the boards processor for standard system-level duties. GigE Vision uses the Gigabit Ethernet communication protocol and delivers fast image transfer using low cost standard cables over long distances. GigE Vision allows for non-streaming device control and accommodates networked video distribution applications that leverage switched Ethernet client/server video networks. Devices such as GigE Vision-enabled lights are automatically recognized by the computers on the network. GigE Vision also enables transmission of compressed images, accurate synchronization of multi-camera systems, and enhanced support for multi-tap sensors. The GigE Vision specification relies on GenICam™, a generic programming interface for all kinds of cameras, to describe the features supported by the camera. Micro/sys single board computers implement interchangeable MIPI CSI camera sensor modules via Micro/sys' CAMStack™ interface board for processing through the ARM Cortex CPU. The Linux BSP has enabled the appropriate camera drivers so pre-validated camera modules are recognized at power-up when the two boards are plugged together. The camera data is fed directly to the ARM NEON GPU, giving users powerful tools for image manipulation. There are numerious run-time variations on these low-cost cameras such as serial interfaces, parallel interfaces, front facing camera, back facing camera, and stero cameras. Pico-ITX 3.9" x 2.8 PC/104 3.5" x 3.5" EPIC 4.5" x 6"
Cell phone cameras have made the MIPI CSI camera inteface poplar. With the introduction of heterogeneous CPUs such as Freescale’s iMX5 and 6, implementing vision applications using the processor rather than a USB I/O channel has become more appealing because the ARM Cortex, as a multi-core processor, already includes GPUs and MIPI camera interfaces. Using a webcam style USB camera requires a lot of system level CPU time since USB is handled directly by the CPU. By using a MIPI CSI port directly from the CPU, the video is routed automatically to an on board GPU, relieving the CPU of vision processing tasks by as much as 35% − resulting in better overall system performance and better vision results. Inadequate software tools made working with a GPU and MIPI camera interfaces difficult in the past. Today these barriers are being overcome with more fully integrated Board Support Packages giving users access to the tools they need to write applications without difficult integration. Below are silicon implementions of NTSC/PAL on the single board computers using an Analog Devices device which is intefaced to the Cortex-A9. The SBC provides a BT.656 interface via the MCX7 connector. Camera data can be hosted by the on-board NEON GPU and the camera/sensor data can then be written to memory and moved to the FPGA for processing or displayed via the on-board HDMI port. 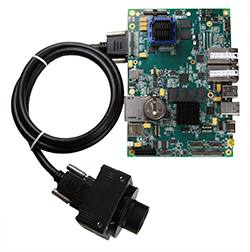 Pico-ITX 3.9" x 2.8" PC/104 3.5" x 3.5" EPIC 4.5" x 6"
NTSC/PAL is used in industrial analog video systems and niche applications not using a digital format, such as protection of copyrighted content on DVDs, video games, and other interactive electronic media. It is the analog broadcast television standard used by television stations for over 70 years before being phased out for digital broadcasting. NTSC (a US standard) delivers content of 525 line scans at 30 frames per second while PAL (a European standard), delivers 625 line scans at 25 frames per second. Onboard video processing through the ARM Cortex CPU converts the image into a digital representation and sends it to the system memory, eliminating the need for a frame grabber. Because NTSC/PAL is an older standard, cameras are cabling are inexpensive and readily availabile. A standard 75ohm coaxial cable up to 100m provides acceptable image quality. Micro/sys' cost-effective thermal processing implementation for industrial applications uses FLIR®'s Lepton® technology. The plug-n-play kit attaches the Lepton sensor to the SBC via Micro/sys' CAMStack™ interface board. FLIR’s Lepton sensor provides a wealth of information and sensor configuration options to maximize its application potential. To showcase some of these capabilities, Micro/sys’s Infrared Imaging Module (IRIM) includes a GUI-based application which not only displays captured infrared images at full frame rate, but also displays accompanying telemetry information and gives users the ability to adjust a number of sensor parameters and immediately observe the results. This application is provided as both an executable and in source form for use on Micro/sys products to give customers a great starting point for their custom application. FLIR Lepton is a revolutionary compact longwave infrared (LWIR) imager bringing low-cost thermal imaging to mobile and embedded applications. With a resolution of 80 × 60 active pixels, these thermal imaging cameras create crisp images which advanced algorithms can read to dispaly the correct temperature values from the images. The Lepton is available in three models: 50° FOV w/o shutter, 25° FOV w/o shutter, and 50° FOV with a shutter for manual calibration. 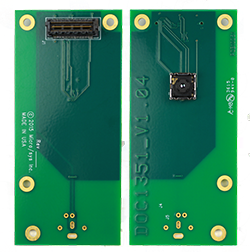 The Mico/sys single board computer below features USB3 Vision® as a standard feature on the board. USB3 Vision is implemented via the USB 3.0 port hosted in the Cortex-A9. The Linux BSP provides easy access to OpenCV and GStreammer to speed up application programming. Additonally, The camera/sensor data can be written to memory and moved to the FPGA for typical vision processing or be displayed real time via HDMI. The onboard FPGA handles all of the vision processing tasks normally performed by a frame grabber which off-loads the boards processor for normal system-level duties. USB3 Vision is based on the USB 3.0 standard, bringing the benefits of easy-to-use camera interoperability to machine vision systems. USB3 Vision transfers data via the bulk transfer mode of USB 3.0 while offering 350 MB/s bandwidth and power up to 4.5W. Multiple cameras can be connected via hubs for larger systems. Camera features are accessed and controlled via the GenICam standard. Standard USB 3.0 off-the-shelf cables up to 8m can be used for USB3 Vision cameras. 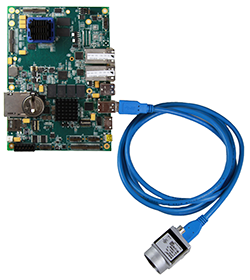 Vision Development Kits include a customizable Single Board Computer, a breakout assembly and/or cable for every external connection, power supply, display, sample software, and a preloaded operating system image loaded on an SD Card for immediate use. 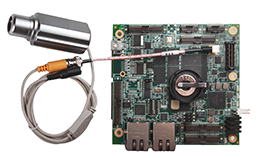 MIPI CSI and Thermal Imaging Kits include a camera sensor module. We can make camera compatibility recommendations for other Kits. For more information and a detailed quote, contact us.